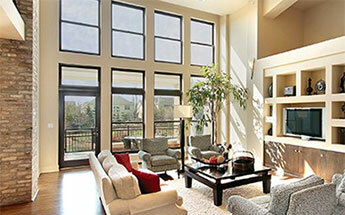 For great, high-quality tint, turn to your LLumar home window tint dealer in Schaumburg. Help save on home energy expenses, give your family an added layer of privacy, and live more comfortably with residential window tinting. For more than 60 years, LLumar's home window tints have provided homeowners with protection from the sun’s heat and harmful rays. Still today, we're here helping families live more comfortably. Your residential window tinting company has been handpicked to provide you, and your family, with a great experience. Visit a LLumar dealer near you for a fast and free home window tinting estimate in Schaumburg! Once installed by one of our certified technicians in Schaumburg, your home window tint helps protect your family from potentially harmful ultraviolet rays, and sometimes the nosy eyes of would-be burglars. Tinting your home’s windows could help prevent the sun from causing your floors to fade, your furniture to be damaged, and any treasured artwork to lose its luster! It helps ward off close to 99% of the destructive ultraviolet rays that cause unwanted discoloration and fading in your home. Over the spring and summer months, it helps keep your Schaumburg home at a more comfortable temperature. In fact, many of our customers reported saving as much as 15% on their home energy expenses after their window tint was installed! As an added bonus, LLumar is LEED-certified, which means you could save even more through tax credits and incentives from the city or government.